Was in Oslo the other day speaking for Norway's Ornithological Society's local section and spend the night afterwards in a hide by Even - "the goshawk whisperer". 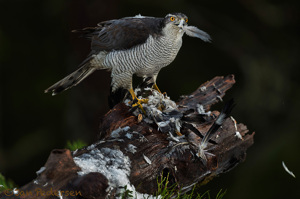 We had this flamboyant Goshawk male eating an entire pigeon. Him being on the alert and keeping a wary eye for the much bigger female.